A powerful start in the single sculls at Nathan Benderson Park in Florida saw O’Donovan set up a victory in 6min 48.87sec, ahead of the fast-finishing Matthew Dunham of New Zealand and bronze medallist Kristoffer Brun of Norway. 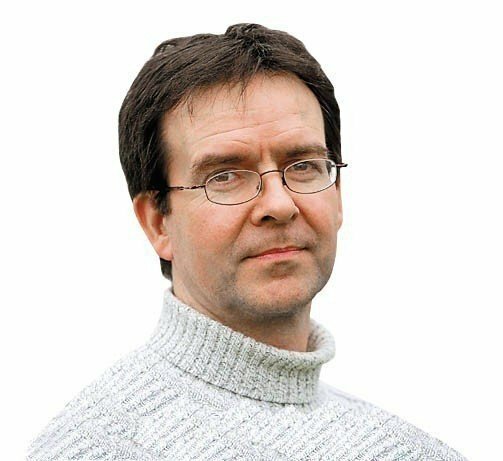 The defending champion was only rowing in this class after his lightweight doubles partner, brother Gary, with whom he won Ireland’s first ever Olympic rowing medal, a silver, at Rio 2016, got ill and could not race. "It was a really good race today," O’Donovan said. "A bit strange without my brother, but I just did the same thing as I would do in the double." 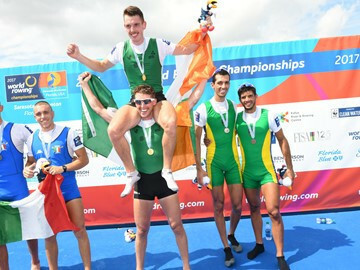 The Cork duo, favourites for the lightweight pairs title after winning three World Cups and the European title, also got off to a dramatic start and had a 1.5 second, 10-metre lead at the halfway stage and pushed on all the way to the line. They finished comfortably with around eight metres to spare over the chasing Italian crew of Giuseppe Di Mare and Alfonso Scalzone, finishing in 6:32.42, with bronze going to Brazil. "We started and were wrecked!" said O’Donovan. "It’s been a really long journey to get here so we are absolutely delighted to be able to take the win." Ireland also had high hopes in the lightweight women’s single sculls final given that their European silver medallist Denise Walsh had recorded one of the two fastest qualifying times along with the South African favourite Kirsten McCann, who raced in the lightweight double at Rio 2016 before switching to the single this year. All the finalists were within two boat lengths of each other at the 500m mark, but Walsh dropped out of the leading contenders soon afterwards and drifted back to a disappointing sixth and last place as McCann pushed on to earn gold ahead of Marieke Keijser of The Netherlands, with bronze going to Mary Jones of the United States, who thus became the first home medallist of these Championships. "I had an ideal race plan for today," said McCann. "I knew in the last 250m it would be really, really tight." France’s Para PR3 mixed double sculls crew fought in vain to add another gold medal, but they were tracked to the halfway point by a Brazilian crew comprising Barcelos De Oliveira and Jairo Klug that moved clear to win in 7:28.95, bettering the world best time by a full 20 seconds as France held off Germany for silver. Hungary won the former Olympic boat class of the men’s coxed pair with a final sprint that took them past the eventual silver and bronze medallists, Australia and Germany. 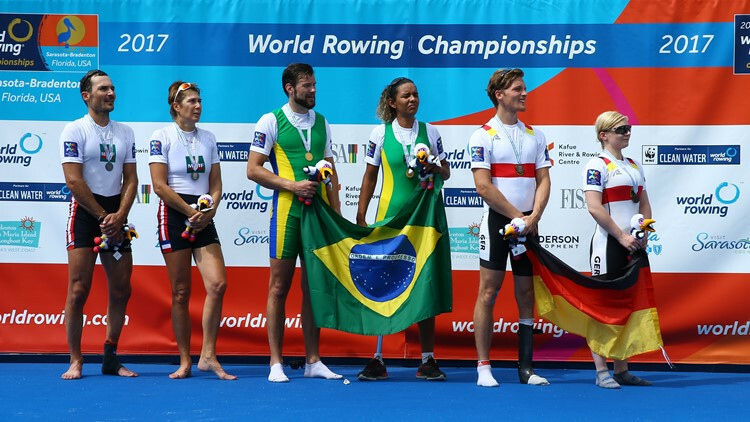 Stroked by the former world champion from the lightweight double, Stany Delayre, France dominated the early proceedings in a dramatic lightweight men’s quadruple sculls final, but Greece moved through to take a slight halfway lead. As the boats moved into their final sprint, Britain charged through to take the lead as Greece began to fade, but another huge push got the French crew to the line first, just 0.17 seconds ahead of Britain, with Greece settling for the bronze medal. France’s Damien Piqueras looked satisfied enough as he stood up in the boat to salute the crowd. The lightweight women’s quadruple sculls title went to Italy’s world under-23 champions, who had produced the best qualifying time. Repechage winners China were early leaders but Italy overtook them before moving clear in the final sprint, where Australia pushed the Chinese back into bronze position. 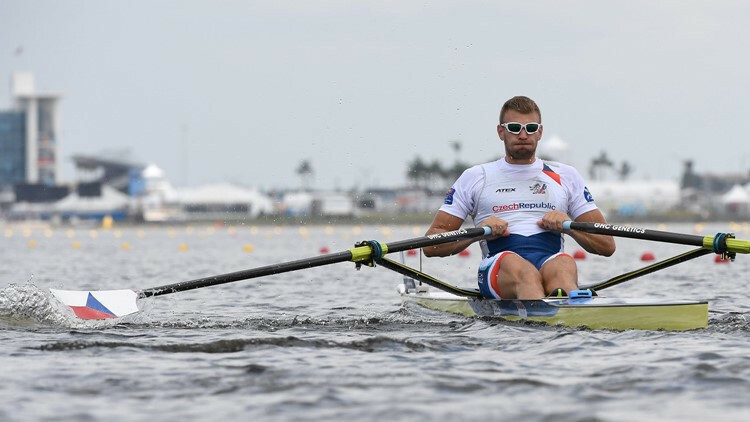 Australia’s double Paralympic silver medallist Erik Horrie won his semi-final in the Para PR1 men’s single sculls, but he will have his work cut out to beat the winner of the other semi-final, Roman Polianskyi of Ukraine, who set a World Championship best of 9:59.54. Switzerland’s Nico Stahlberg has had a great season in the mem’s single sculls, but after taking an early lead in his semi-final he could not deal with the weight of experience that came to bear upon him in the form of eventual winner Ondřej Synek, the Czech Republic’s 34-year-old four-times world champion. Cuba’s Angel Fournier Rodriguez, who took second place, and New Zealand’s Robbie Manson, holder of the world best time. Britain’s Thomas Barras won the other semi-final ahead of Croatia’s Olympic silver medallist Damar Martin, with Germany’s Time Ole Naske taking the last final place. Britain’s Victoria Thornley lost an early lead in her women’s single sculls semi-final but regained it when it counted to finish clear of Lisa Scheenaard of the Netherlands and Canada’s Carling Zeeman. The fastest qualifier, Jeannine Gmelin of Switzerland, won her semi ahead of Ireland’s Sanita Puspure and Magdalena Lobnig of Austria. Norway’s Rio 2016 bronze medallists Kjetil Borch and 41-year old Olaf Tufte reached the men’s double sculls final with second place behind Poland in their semi-final, with Italy joining them in third. France beat New Zealand in the other semi-final, with Lithuania taking the final qualifying spot. Olympians Meghan O’Leary and Ellen Tomek of the United States had the fastest qualifying time coming into their women’s double sculls semi-final and they lived up to that stat as they won ahead of Lithuania and France. New Zealand’s Brooke Donoghue and Olivia Loe were winners in the second semi ahead of Australia and China.